Given how much the Tea Party rails against the Republican Party and the establishment, it seems contradictory that more non-Tea Partiers actually have a negative opinion of the party as a whole. Except, this view doesn’t take into account what the party is actually doing. The fact of the matter is that the Tea Party controls the House GOP right now, which, as the only part of the party that controls a branch of Congress, then has the ability to dictate its agenda. Thus, the government shutdown, no immigration reform and a strict adherence to no new revenues. These are all policies that grew out of the Tea Party movement and the Republican Party has now adopted. 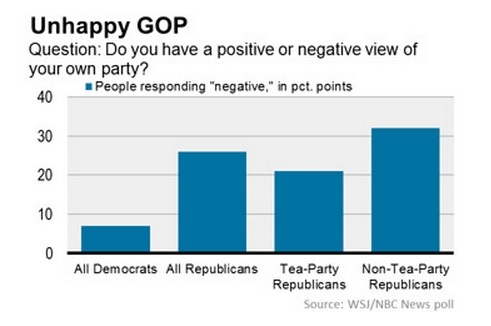 Of course, the Tea Party has more favorable views of the Republican Party than non-Tea Pariers do! The Tea Party is in control. 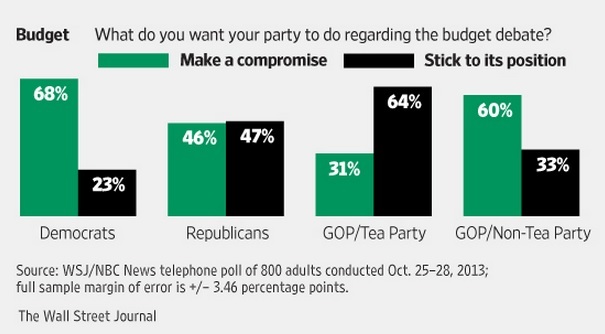 Non-Tea Partiers want to make a budget deal by an overwhelming amount while the Tea Party wants the party to stick to its position by an even greater amount. Overall, the party is split. Guess what? The Tea Party wins. We certainly aren’t getting a big budget deal. At most it will be a small compromise and even that is unlikely. Polling for immigration reform shows a similar split where the Tea Party is against a path to citizenship while the rest of the party is open to it. There too, the Tea Party’s preferences have become the Republican Party line. This perfectly represents why non-Tea Partiers give the party such a negative view as a whole. They are the ones who have been cut out and ignored, not the Tea Party. If anything, it’s surprising that nearly a fifth of Tea Partiers have a negative view of the GOP. After all, the Republican Party is following the Tea Party’s strategy to a tee.